Monographs, edited collections and other long-form publications are a very important part of the academic publishing world, and they hold particular importance for scholars in the humanities and social sciences. But many people tell us that monograph publishing is facing difficulties: sales are falling, costs are increasing, and scholars are finding it harder to find an outlet for their work. A new HEFCE project – we want to understand the issues better, and help to identify potential ways forward. We have started a project, in collaboration with the Arts and Humanities Research Council and the Economic and Social Research Council, to help us do this. Geoffrey Crossick, Distinguished Professor of the Humanities at the School of Advanced Study, University of London, is leading this work. Professor Crossick was formerly Vice-Chancellor of the University of London and Warden of Goldsmiths. We have convened an Expert Reference Group to establish what evidence is needed to inform understanding in this area, and to provide advice on an appropriate programme of work to gather this evidence. The group brings together key representatives from interested organisations to develop increased understanding about the challenges and opportunities for open-access monograph publishing. A steering group comprising representatives from HEFCE, the research councils, and the British Academy will govern the project. We expect the project to run until mid-2014. Two years ago, I could have never imagined the role that I would ultimately play in BU’s REF submission. At the time, I was a research fellow at a nearby institution and in that fortunate position of being able to take a certain detached distance from the whole REF process. Even so, there was a building surge of preparations absolving more and more time for my senior colleagues; simulation exercises were underway and the work of some of the brightest and the best critically scrutinized. Tensions were raised, impact was feared, but for the most part at that stage, I was progressing a number of research projects which meant a lot of time out of the office and in the field. As you may have read in Julie’s earlier post, babies became a central feature of the REF team. When we knew Sally was going on maternity leave, I was asked to continue her work on supporting the development of the impact case studies for the REF. Although a mammoth task, it was an opportunity that I could not refuse. On my last day in my previous institution, I had co-organised an event around ‘food and the third sector’, aimed at bringing together key practitioners with leading academics in the field. It was a terrific event and I believe genuinely developed new understandings between key practitioners, policy makers and academics. One of our speakers (not so co-incidentally) was Kevin Morgan (one of my first bosses and recent winner of an ESRC impact prize) was delighted to hear of my new role at BU and I remember him saying (in his distinct lyrical tones) that ensuring research was of benefit to society was ‘in my blood’ – probably true given I come from a family of engineers and technology experts! How you demonstrate impact was also a question that was fresh in my mind having spent the previous two and a half years conducting research with third sector organisations. For charitable causes, impact is king – fundamental to continued support and funding is the need to demonstrate the difference they make to society. In September 2012, the impact challenge was on. 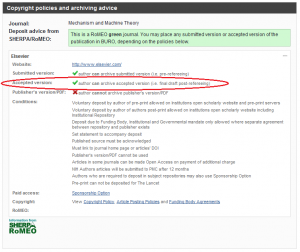 Following a set of agreed actions devised by Matthew, Sally and all the impact case study authors in June 2012, the next task was for the work that had been prepared to date to be transferred into the required HEFCE template. This is harder than it sounds: the template was to be a maximum of four pages with indicative word limits for each section and highly prescribed guidance on each section. At this time, a number of new potential case studies also emerged, and I worked with the authors to develop these and ensure they found their way into the template. The process of doing this was tremendously challenging for all concerned. How do you summarise up to twenty years of research in a few hundred words? What happens if your research and impact was non-linear? What happens if the sources to corroborate your impact are no longer available? What would happen if the impact was in the process of happening? We found our way through these questions as a team, but we won’t necessarily know the answers to them until the end of next year – however good HEFCE’s answers to the sectors endless queries, it will ultimately be the decisions made in the endless meetings that will take place over 2014 which will determine these. What did become increasingly clear was the extent to which the impact case studies would be dependent on creating a strong narrative. With such a small amount of space to tell a complex story, this was easier said than done and across the sector colleagues were struggling with how to achieve this. I seem to have spent a not inconsiderable amount of last year in a small room in a hotel in Bristol with other members of REF teams encountering the same issues to which there was rarely an easy answer to. In some ways it was reassuring to know BU was grappling with the same issues as all our colleagues across the sector. However, it highlighted just how we much were making preparations for the big unknown, i.e. how panel members would react when they caught sight of our impact case studies. At the same time, a huge number of ‘impact consultants’ seem to have popped up and my inbox filled with offers of very expensive help. This proved to be a hot topic last year, the extent to which expertise should be ‘bought-in’. Some colleagues just wanted their case studies sorted, however, what stays in my mind was a reflection from a professorial colleague at another (research intensive) institution. He was furious that a ‘science writer’ has been imposed on him, making the argument that he was a professional writer and no-one was better placed to write about his research or the impact it had made, although he acknowledged that learning to write case studies was a new skill. That reflection has stayed with me; writing impact case studies is a particular skill, but arguably one which all academics will have to learn in future years. 2013 started with a writing retreat over in Christchurch, which was an excellent opportunity for peer learning, reflection and contemplation. As the depths of winter gave was to spring, the mock exercise was on and all the impact case studies needed to be in as final form as possible ready for external review by our expert (and mostly non-academic) panel. This was a tense moment; we knew that ‘research users’ (i.e. those in a position to use the research arising from Universities) will be on the REF panels; therefore, it was essential that we had feedback from this community. In the end, their feedback, mostly confirmed what we already knew. Getting everything ready in-time was a huge amount of effort, especially for my colleague Peng Peng (who did an amazing job throughout) – there were many late nights in the office and we kept each other going with increasingly banal banter and many cups of tea. We were also putting around double the number of case studies into the mock exercise that we would ultimately need. At the same time, I was also working on another major initiative for BU, the first Festival of Learning – which included over 100 free events, which in itself was a mammoth undertaking. As the law of sod will dictate, as the mock exercise meetings for our impact case studies fell over the two weeks that the Festival was running. This meant for an extremely busy fortnight for me, with many costume changes – typically my day would start setting up the Festival by 7.30am, (in our Festival t-shirt and jeans), with a quick change into something smarter for the panel meetings, followed by Festival trouble shooting and most evenings a Festival event well into the evening. I didn’t really see home or my husband in that fortnight, but it was an incredibly productive two weeks and somehow the timing felt right. It was with a sense of pride that I was able to show our panel members around the Festival and demonstrated that ensuring our research is of benefit to society wasn’t just something we were doing for the purposes of the REF, but something embedded in BU’s DNA. Following the mock exercise, Sally came back from maternity leave. It has fantastic to have such a great colleague back with us and Sally was able to bring a fresh pair of eyes to the process and her superb writing skills. She bravely took up the baton of the impact case studies and honed those that had been selected following the mock exercise. This freed up my time to concentrate on the impact narratives, which proved to be especially tricky. Like the impact case studies, we did not have any examples to work from previous exercises. They also asked us to demonstrate the approach to impact taken by each unit of assessment; this was easier said than done as reach back to 2008, there was not necessarily any formalised plans for approaching impact – so this meant drawing on institutional knowledge to develop this section. Working with unit of assessment leaders on future impact strategies was exciting but challenging. Introducing impact as part of the REF has raised many questions, many of which we do not have the answers for. When we reached November 2013, I remember it seeming quite surreal that the date which we had been focusing on for so long, was finally in view. Naturally, there were some last minute amendments to our submission, but overall the period in the REF team was reasonably cool, calm and collected. Waiting for the button to be pushed, and for the 29th November to pass, felt like time was suspended. And now we wait… although given the years of preparation that have already gone in, a year doesn’t feel so long. – The ‘impact agenda’ isn’t going anywhere. Many colleagues suggested that HEFCE would find a new way to torture us in REF 2020, but I think it is safe to say that demonstrating impact is here to stay, and is likely to be a larger element of the submission next time around. – Our REF preparations have created a superb resource. Yes, it was a huge amount for everyone that was involved in the REF return, however, it has enabled us to demonstrate the very best of what BU does. – We must not waste or lose the institutional learning or resources created in preparation for the REF. In creating an amazing resource for the REF, we share this learning throughout the HE sector an engage the public with it. – It has opened the debate about what are Universities are for. Should Universities be drivers of economic growth? Should they be cultural providers? Should they provide the evidence demanded by policy makers? Questions about what universities are far are the as old as the institutions themselves, however, the impact case studies once published will provide interesting food for though. What the REF has perhaps made apparent is that within institutions, there are widely different views on what the future for HEIs could or should be, which in-turn can lead to considerable tension. – It has raised questions about who sets the questions. Who drives our enquiry? Does research answer the questions needed by society, or is it our academic community that sets the questions? I suspect the answer lies somewhere within a continuous iterative process, but others may have a very different view. – Impact is far more than happy what we can submit to the REF. So much of BU’s best impact does not meet the criteria set out by the HEFCE guidelines, but that does not mean we should stop doing in. In-fact, quite the opposite. As a community we need to challenge the definition of impact and take ownership of it. This means engaging with the impact agenda, not dismissing it. – Public engagement is about far more than impact. Public engagement can be a pathway to impact, however, it is also about far more than impact as defined in-terms of the REF. It is also about inspiring and informing future research, demonstrating the broader public value of HE, celebrating what we do, being accountable and recruiting the research participants of the future. I will, I am sure, have far more observations and reflections over the coming weeks and months. 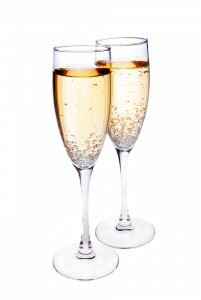 But until then, I will forward to a break over Christmas before starting in earnest with our REF 2020 preparations. This is something which I genuinely look forward to – despite the inevitable stresses that have arisen from the process, being part of the REF team has brought home just how fantastic BU is and how much opportunity there is to grow and develop as an institution moving forward. On (almost) completing the REF2014 submission. For the whole of last week people kept coming up to me and saying ‘you must be relieved now that the REF is submitted’. I, of course agreed with them. But inwardly I was beginning to panic slightly, thinking about the 101 sticky labels which I had to produce and to affix to each and every item of the physical outputs and portfolios to be delivered to HEFCE by the end of this week. So, no feelings of jubilation yet for me, I’m afraid. That however, did not stop me from joining in the merriment at the office last Friday, celebrating the official electronic submission to the REF2014, and toasting various individuals who have contributed, one way or another to the successful submission of REF2014. It’s good to see that when such an extended and major project comes to fruition, due recognition is given to people who have made it happen. This is especially meaningful and heartfelt coming from the Vice Chancellor as well as the Pro-Vice-Chancellor. In my own little REF world, however, I would like to thank MY unsung heroes, starting with the Bournemouth University librarians who prioritised any scan requests when chapter or journal outputs were desperately needed; the helpful PAs who had the ‘power’ to shift heaven and earth to free up meeting slots in people’s diaries for important REF meetings, and many others who I have failed to mention. Most importantly, thanks to my colleagues in the RKEO team. The fantastic and efficient support kept me going; kept the whole REF going – processing claim forms for external reviewers, sorting out accommodation requests, ordering catering, ordering stationery and even dropping everything they were doing to provide emergency data entry and checking support when called upon. Even those who have left our team, have left a legacy behind through REF. My gratitude also extends to understanding fellow colleagues who knew the importance of the REF and constantly provided moral support; to my fellow after-hour office mate, Becca who on one particular desperate evening, started singing ‘the drugs don’t work, they just make you worse’ (don’t ask!) and last but not least, Rita Dugan, who held my hand as I sobbed into my handkerchief when it all got a bit much!! I realise that this is beginning to sound a lot like a speech one would give upon receiving an Oscar. I haven’t won anything, I remind myself. But this whole 17 months leading up to the submission has been a really fun, exhilarating and challenging roller coaster ride which is constantly in the upward position. As soon as I started this post, I practically hit the ground running. When I came into post, we were in the initial stage of organising the Summer 2012 Outputs Mock Exercise. Following that were a series of major events to be organised. Just to name a few – a mid mock review, a writing retreat, BRIAN training programmes, testing of the REF submission system, the Spring 2013 Full Mock Exercise, another series of external panel reviewers meetings, which included meetings to discuss the impact case studies reviews; multiple RASG and RALT meetings; finalising the staff selection for the REF2014 submission; uploading all information onto the REF submission system; double and triple checking the system for accuracy with Julie Northam… etc, etc, etc. And amongst all that, I have also somehow managed to squeeze a wedding into the mix. On that note, I will now continue with my sticky label frenzy. And this Friday after work, do open a bottle of champagne and help me celebrate as by then, all the boxes to HEFCE would have been out the door and that’s when I can properly celebrate! Cheers! Last week we pushed the Big Red Button (actually many big, yellow buttons) after many years of hard work preparing and finessing every last bit of the University’s submission to REF 2014. I first got involved with REF in late 2008 which seems like a distant memory now. HEFCE were consulting with the sector on bibliometrics and the role that citations should play in the REF which at that point still didn’t have a submission date. BU was lucky enough to be one of 22 institutions taking part in the bibliometrics pilot to test the reliability and validity of citations and ways of identifying authors and papers in the large publication databases, Scopus and Web of Science. There were a lot of meetings in London and so one of my first introductions to REF was standing on a cold, dark train platform at 6am with Anita Somner, waiting to get the train to one of the REF events! In December 2008 the RAE 2008 results came out and that prompted a series of RAE/REF roadshows – in essence Prof Nick Petford, the then PVC, and I visiting all Schools to talk about the RAE results and introducing people to REF and how it was likely to be different. Then a lot of the central REF drive died down which on reflection was a shame but also inevitable. In 2009 all we knew about the next REF was that it would comprise outputs, environment and impact, but the key information about the assessment was still unknown. For example, we didn’t yet know what the role of citations would be and in which UOAs this would apply, we didn’t know how the impact element would be assessed, the weightings weren’t agreed, we didn’t know what the environment template would look like or what information would be required. With so much unknown it was very difficult to prepare anything other than for the outputs element and so the message given out was to concentrate on publications, getting them in the strongest outlet possible (we didn’t even know at this stage whether the number of outputs required per individual would be 3, 4 or 5! ), and much of this work was driven from within the Schools. Fast forward to 2010. We had a change of senior leadership at BU with Prof John Vinney becoming VC and Prof Matthew Bennett taking the strategic lead for RKE (officially becoming PVC in January 2011). There was still a lot undecided about REF; HEFCE had finished the bibliometrics pilot and were currently undertaking an impact pilot to test how best to assess this part of the REF. At BU the new leadership provided by John Vinney and Matthew Bennett kickstarted our central REF preparations. John established the REF Academic Steering Group in summer 2010 with a remit to take the strategic lead of BU’s preparations for REF. UOA Leaders were identified in the then 12 subject areas in which we were considering submissions and they formed the REF Academic Leadership Team. In the absence of templates or guidance from HEFCE we started work on the first drafts of the environment narratives and did the first trawl of outputs, inviting staff to submit up to four outputs for a light-touch review exercise that winter (282 individuals submitted a total of c. 1,128 outputs). 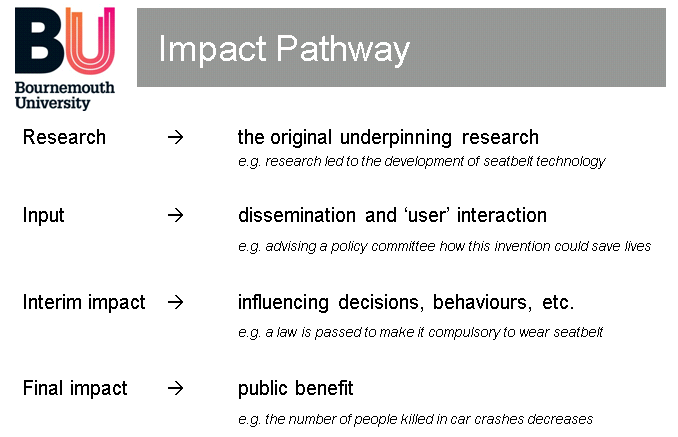 In autumn 2010 HEFCE published the results from the impact pilot, including some good practice examples of what we then knew to be one of the submission templates – the impact case studies. Armed with this new information we undertook impact training with all of the Schools, using the infamous seatbelt example of how research can be undertaken and disseminated to achieve interim and then final impact and being informed by HSC that a reduction of the number of people killed in car crashes was actually a negative impact as there were less organs available for donation! I have provided this lovely linear example of impact for posterity. Around this time we also started to write up the first impact case studies, some of which evolved into the ones submitted last week. In 2010 HEFCE confirmed what the UOAs would be and released the first list of who would be on the sub-panels. 2011 was a good REF year! HEFCE confirmed in March how impact would be assessed in the REF and the official guidance document was finally released in June, providing us with something concrete on which to base our REF preparations. It was the year we employed Sally Gates as the Research Communications Manager, focusing specifically on REF with the remit of working with colleagues to write the impact case studies in earnest. We held the first of our HEFCE-supported REF events at BU attracting over 150 delegates from 39 institutions and speakers including the Deputy REF Manager Chris Taylor (HEFCE) and key academics involved in the impact pilot, including Prof James Goodwin (Age UK), Prof Peter Taylor-Gooby (University of Kent) and Prof Jim Griffiths (University of Plymouth). This not only gave us an insight as to what was required for this still-very-unknown impact element, but also raised the profile of BU as a research university. We held another mock exercise in winter 2011-12 to ask a selection of external reviewers to assess the draft environment narratives and impact statements. I think it is fair to say that 2012 was a somewhat bizarre and full-on year, primarily due to the significant changeover in staffing but also because we were only a year from submission. The year started with HEFCE releasing the Panel Working Methods and Criteria – key documentation detailing what the panels expected to see in the submissions. This, along with the Guidance on Submissions published the previous year, became a lot of people’s bedtime reading for the next 23 months. Despite swearing not to do so again (!) in February we held another HEFCE-supported REF event, this time focusing on how each of the Main Panels will assess research, and attracted over 150 delegates from 32 institutions, again putting BU on the research map. We submitted the BU REF Code of Practice to HEFCE to the first of two possible opportunties and were pleased when it was approved first time (this wasn;t the case for a lot of other institutions). Becca Edwards joined us in April as Public Engagement Officer and was immediately keen to be involved in the impact element of the REF, showing how public engagement could be a route to impact. In the summer we held another mock exercise – this one focusing solely on outputs (265 individuals and c. 1,325 outputs). Then bizarrely the three key REF staff in the R&KEO had babies between September and December 2012, resulting in a changeover of staff supporting the preparations – Pengpeng Hatch replacing Anita Somner, Becca Edwards replacing Sally Gates and Rita Dugan replacing me. In December we responded to HEFCE’s Survey of Submission Intentions, a rough approximation of which UOAs we might submit to, how many staff, and the areas of the impact case studies. This information was used to determine whether additional expertise was required on the Sub-Panels. And then we came to 2013 – the year of submission. Did we feel prepared? Kind of, although there was still an awful lot to do; in fact I would go as far to say that REF probably dominated most waking minutes of those closely involved on an increasing basis as the year progressed. The final mock exercise was held in spring 2013 (322 individuals and c. 1,610 outputs) and was a full exercise including assessment of outputs, environment narratives, impact statements and impact case studies. This was a huge amount of data to pull together and it was essential that it was undertaken well as the results, along with those from the exercise the previous year, would be used to determine staff selection decisions. I came back from maternity in the midst of the review meetings that followed the mock exercise, very much a baptism of fire back into the REF. Wherever possible we tried to emulate how the panels might assess the work in the real thing, for example, with a panel of research users assessing the impact case studies. After these meetings RASG met with UOA Leaders in a series of gruelling meetings in a very stuffy room in Christchurch House to go through each individual member of staff and their output scores, determining who’s outputs would be included in the final submission. These decisions were ratified by the VC in July, decisions were then relayed to staff and an appeals period ran during the summer. During this period we continued to get new outputs externally reviewed and considered, and had c. 100 new outputs assessed during this time. The summer saw the return of Sally Gates from maternity leave and she took on the responsibility for rewriting and finalising the impact case studies, by all accounts doing a fantastic job. In the autumn a huge amount of work went into finalising and finessing the environment narratives and impact statements, primarily involving the UOA Leaders, Profs Matthew Bennett and John Fletcher, Becca Edwards and myself. I know from personal experience that a lot of sleep was lost during this time and there were many iterations of the narratives written. 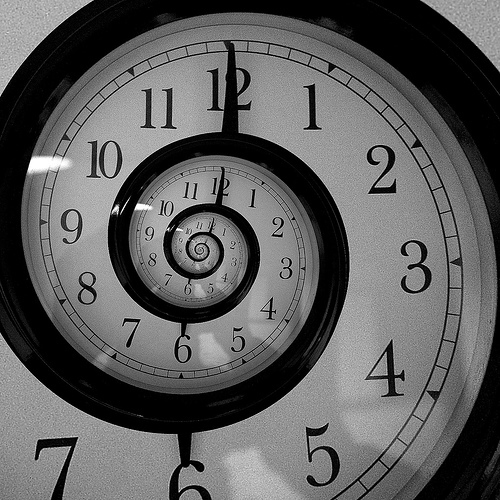 Tuesday 26th November, 9:30am – button pushing time. After checking, rechecking and checking the data again it was time to submit. The #ref2014 hashtag on Twitter had gone crazy with institutions posting that they had made their submissions and now it was BU’s turn. There were lots of submit buttons and they were all yellow – submit, validate, submit, declare and submit, submit, are you sure you want to submit?! We pressed them all and that was it – BU’s REF 2014 submission was sent to HEFCE only to be acknolwedged with a rather bland, system generated email confirming receipt of our submission. Sadly there were no fireworks or party poppers or massive thanks from HEFCE for all the hard work that went into preparing every last part of the submission. REF has involved hundreds of people from across BU – from the UOA Leaders to those academics who have produced outputs, won grant funding or supervised doctoral students, from the REF Circs Board to the REF Appeals Panel, from the RKE Ops and Graduate School staff who support research activity and checked the REF data, to the members of RASG – the REF submission is the culmination of everyone’s hard work over the past few years and for that reason I am immensely proud to have been involved. Roll on the results in December 2014! And you may be surprise, amazed or even horrified to know that we have already started planning for REF2020…! The majority of the BU REF2014 Staff Selection was finalised last month, although the review of new and additional outputs is currently still on-going to maximise Bournemouth University’s REF2014 return. Post BU REF2014 Staff Selection process, the BU REF Team are now currently working on gathering and collating all necessary information to be uploaded onto the external REF Submission System before the deadline of the 29 November 2013. 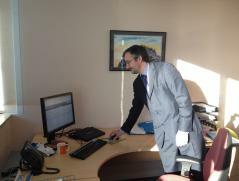 The University’s publications management system BRIAN is being used to help gather and collate relevant outputs data. If you notice that your REF2014 profile on BRIAN has changed, please don’t be alarmed – this is part of the process in getting all outputs data ready to be uploaded onto the REF Submission System. If you would like to find out more about the current BU REF2014 progress, please don’t hesitate to get in touch with me at pengpeng.ooi@bournemouth.ac.uk. The latest BU REF Highlight Report (#15) is now available for BU staff to download. It covers the period from February 2013 to August 2013. You can access your copy of the report from the following location on the I-drive (just copy and paste the following into Windows Explorer): I:\R&KEO\Public\RDU\REF\REF prep arations\REF highlight reports. Next week there will be two BU REF2014 Open Forums to provide the opportunity for REF eligible staff to find out more about the provisional thresholds for the BU REF2014 staff selection process and to ask relevant questions. You can attend either one of the forums and there is no need to pre-register for these events. Please feel free to get in touch with me (jnortham@bournemouth.ac.uk) or Peng Peng Ooi (pengpeng.ooi@bournemouth.ac.uk) if you wish to find out more. In Jun e, after the REF Academic Steering Group have met, there will be a series of BU REF2014 Open Forums. These forums will provide the opportunity for REF eligible staff to find out more about the provisional thresholds for the BU REF2014 staff selection process and to ask relevant questions about them. Please feel free to get in touch with me (pengpeng.ooi@bournemouth.ac.uk) or Julie Northam (jnortham@bournemouth.ac.uk) if you wish to find out more. The University is currently preparing to take part in the first Research Excellence Framework (REF) assessment, which is a national exercise to assess the quality of research in UK higher education institutions. To ensure that the University abides by its principles of transparency, consistency, accountability and inclusivity in preparing and finalising the BU submission to the REF, the BU REF 2014 Code of Practice (v2), BU REF Frequently Asked Questions and BU REF Individual Staff Circumstances Disclosure Form have been developed and are now being formally disseminated to all BU academic staff to ensure all eligible staff are fully informed. If you are planning on submitting to the REF2014 assessment, there is a possibility that you might be eligible for a reduction of outputs, depending on your individual circumstances (please see link for more information). To find out if you are eligible for REF submission, please see section 3.1 of the BU REF 2014 Code of Practice and ‘Staff eligibility’ in the BU REF FAQs. You are then encouraged to complete the disclosure form. If further information is required about any circumstances disclosed, you will be contacted by a member of the HR team involved in the REF. You should print out, sign and return your completed form marked ‘REF Confidential’ to Judith Wilson, HR Manager, M601, Melbury House, 1-3 Oxford Road, Bournemouth, BH8 8ES. Alternatively, you can also email your completed form to refcircumstances@bournemouth.ac.uk. The BU REF Circumstances Board next meet in May 2013 so if you feel that you have circumstances which you wish to disclose, please do so as soon as possible. For more information on BU REF2014, please click on ‘ref’ on the right-hand tab, which will take you to all previous blog posts on all things REF. Please feel free to get in touch with me or Rita Dugan (rdugan@bournemouth.ac.uk) if you wish to speak to someone about your REF eligibility. Back in Autumn 2012, the Research and Knowledge Exchange Development and Operations Team(RKEDO) conducted the first round of the BU REF Individual Staff Circumstances data collection (please see link for more information) on a large scale, with a submission deadline of the 31 October 2012. Since then, data collection has been on-going and all new and existing REF eligible staff have been actively encouraged to disclose relevant individual circumstances. There were also 11 applicants where staff had wanted their individual circumstances known but were not seeking a reduction in outputs. The BU REF Circumstances Board will meet again in Spring/Summer 2013 to consider any new cases or existing cases with changed circumstances. The latest BU REF Highlight Report (#14) is now available for BU staff to download. It covers the period from November 2012 to January 2013. You can access your copy of the report from the following location on the I-drive (just copy and paste the following into Windows Explorer): I:\R&KEO\Public\RDU\REF\REF preparations\REF highlight reports. With the preparation for the BU REF Spring 2013 Full Mock Exercise in full swing, the deadline for nominating your Research Outputs on the REF2014 module on BRIAN is looming up. 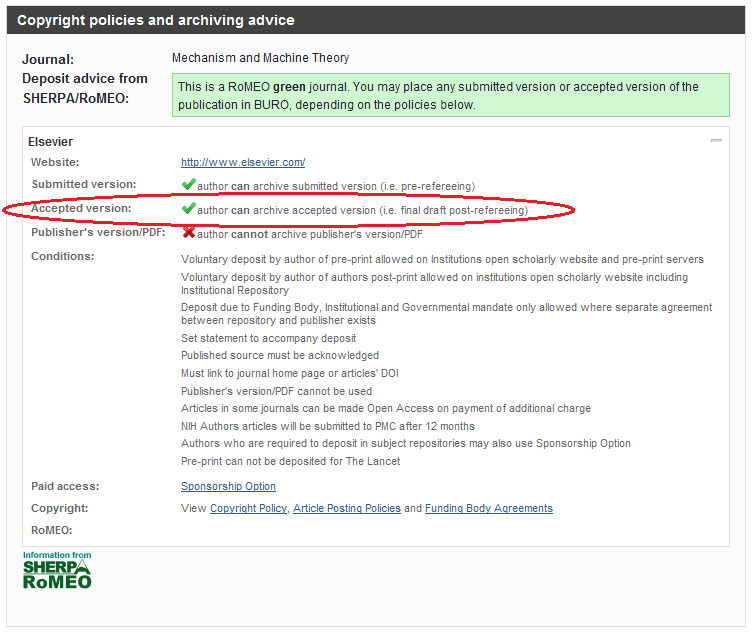 In a previous blog post, we shared with you the official guidance document on making your NRO (nominated research output) selection. The REF2014 module is extremely straightforward and intuitive. The guidance note will provide you with a step-by-step instruction on nominating your research outputs. If you find that the REF2014 module is missing from your BRIAN account, please get in touch with Peng Peng Ooi (pengpeng.ooi@bournemouth.ac.uk) or Rita Dugan (rdugan@bournemouth.ac.uk) and we’ll be able to help you. A while back, we posted a really useful blog on the frequently asked questions about the Research Excellence Framework (REF2014) national assessment, in particular within the context of Bournemouth University (please click on ‘BU REF FAQs’ for the post). Not much has changed since then except that preparations are now in full swing for the Spring 2013 Full Mock Exercise and all Nominated Research Outputs are to be selected via the REF2014 module on BRIAN before the 15th February deadline (an official guidance has been produced to help you with this).